Neighbors for Environmental Safety Today (NEST) is celebrating the end of its fight against Waste Management Inc. that has lasted for over a decade in Forsyth and Guilford counties. In October 2004, the Piedmont Landfill was capped and closed, ending WMI attempts to expand the landfill on 300 acres on the Forsyth-Guilford county line. NEST defeated WMI expansion seven times on the old tract. On October 23, 2004, NEST members gathered for a Pig Pickin' Celebration in Oak Ridge, NC. Several BREDL Board members joined the celebration after the Board's meeting. The WMI Piedmont Landfill opened July 1990. NEST organized September 1990. Originally, the Piedmont Landfill was to be a Kernersville landfill for local garbage until after it was sited, and then they were permitted to bring garbage from all over North Carolina and 6 southeastern states. It was supposed to last from 23-30 years and it was almost filled in 8 years. Then they cut back on the intake and tried to expand into Guilford County. It was completely filled in 14 years. Throughout the history of the Piedmont Landfill, Waste Management Inc. made several attempts to expand the landfill. Each time, NEST was there to ensure it didn't happen. December, 1997: Guilford County Planning Board voted 5-3 against Waste Managements proposal for expansion of Piedmont Landfill operations into Guilford County. 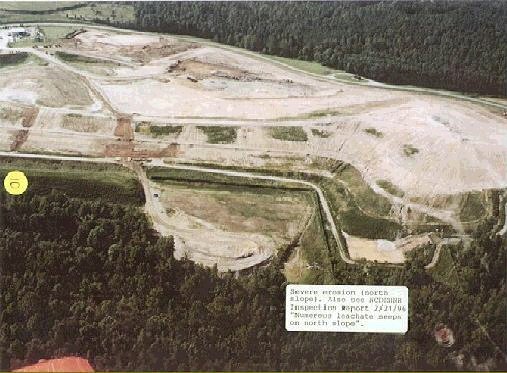 February, 1998: Guilford County Commissioners voted 7-1 against Waste Managements request for Special Use Permit to operate Piedmont Landfill in Guilford County. November, 1999: Forsyth County Planning Board voted 6-1 against Waste Managements request for rezoning in order that they could raise the elevation of the landfill and continue operations. June, 2000: Forsyth County Planning Board rejected for the 2nd time Waste Managements request for rezoning to allow them to raise the permitted elevation and continue operation in Forsyth County. August, 2000: Forsyth County Commissioners rejected Waste Managements request for continued operation in Forsyth County by a unanimous vote. October 8, 2003: Guilford Co. NC Planning Board voted 7 - 0 to deny Waste Management's request to rezone property for landfill expansion. WMI appealed to Guilford County Commissioners. November 6, 2003: Guilford County Commissioners denied by a 7 to 4 vote the request by Waste Management to rezone from Agricultural to Heavy Industrial. This vote effectively stopped the dump from coming into Guilford County. Facts were presented that proved the proposed use of the land would materially endanger the public health or safety if located where proposed. · Environs of the Piedmont Landfill are residential with individual wells (not municipal water) and have no means of obtaining water should an accident occur. · Monitoring wells have already shown evidences of contamination, posing a threat to the groundwater supply of existing homes and deterring residential growth. · Natural Resources were reviewed as evidence of the occurrence of leachate seeps. In one instance, a berm side blowout required a special, emergency inspection. · Evidence was presented exhibiting the type of continuous exposure to garbage by the residents of the neighborhoods through which the trucks travel. Garbage included soiled diapers, spoiling food remnants, etc. Video evidence was presented showing trucks traveling at excessive speeds through our neighborhoods without proper tarping, allowing the garbage to escape from the trucks.